Many of former Vice President Joe Biden's would-be 2020 competitors are weighing in on allegations from several women that he made them feel uncomfortable with inappropriate or unwelcome physical contact. As the Democratic field takes shape ahead of Biden's potential entry, several Democratic presidential candidates have responded to the allegations with varying degrees of delicateness — although most do not think he should be disqualified from jumping into the race. 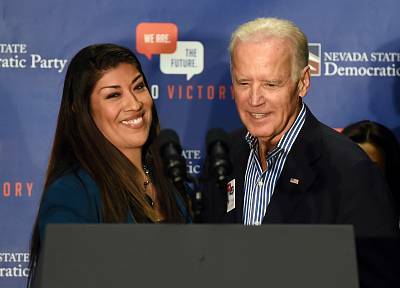 After Lucy Flores, a former Democratic nominee for Nevada lieutenant governor, said last week Biden made her feel uncomfortable by smelling her hair and kissing her head at a 2014 campaign rally, six other women have come forward with their own allegations of encounters Biden that they said made them feel the same way — one to The Hartford Courant, two to The New York Times, and three to The Washington Post. So far, none of the women who have come forward have alleged Biden made overt sexual advances, and other women have stepped forward to defend the former vice president, saying they found similar physical interactions with him to be comforting or supportive. Biden, for his part, responded to the allegations Wednesday afternoon by posting a two-minute video on Twitter in which, without directly apologizing to his accusers, he acknowledges the changing times. In the video, Biden said that what he viewed as "gestures of support and encouragement that I've made to women and some men" have sometimes made them uncomfortable. "Social norms began to change — they've shifted, and the boundaries of protecting personal space have been reset — and I get it, I get it," Biden said. "I hear what they're saying. I understand it. And I'll be much more mindful." Biden also addressed Flores' allegation in a statement Sunday, saying that in all his years on the campaign trail and in public life "not once — never — did I believe I acted inappropriately. If it is suggested I did so, I will listen respectfully. But it was never my intention. I may not recall these moments the same way, and I may be surprised at what I hear." "But we have arrived at an important time when women feel they can and should relate their experiences, and men should pay attention," his statement continued. "And I will. I will also remain the strongest advocate I can be for the rights of women. I will fight to build on the work I've done in my career to end violence against women and ensure women are treated with the equality they deserve. I will continue to surround myself with trusted women advisers who challenge me to see different perspectives than my own." Here's how the 2020 Democratic candidates have thus far responded to the allegations against Biden, who could announce a presidential bid as soon as this month. Warren, D-Mass., was one of the first 2020 presidential candidates to respond to Flores's allegation against Biden and gave perhaps one of the most forceful responses from a Democrat as well. "I believe Lucy Flores — and Joe Biden needs to give an answer," Warren told reporters during an Iowa campaign event on Saturday. When asked if she thought Flores's allegation should disqualify Biden from entering the presidential race, Warren said he or any candidate facing a similar allegation would need to make that determination himself. "That is their decision about whether or not to run, and it will be up to Democratic voters whether or not to support someone," she said. "That's the process. Castro, who served with Biden in the Obama administration as the then-secretary of housing and urban development, appeared at the same Iowa campaign event as Warren on Saturday and also told reporters that he believes Flores. Castro said the United States needs to be a nation where people can feel free to come forward with allegations, and that Flores deserves to have her account be heard. "It is good that today, in 2019, that we take women who come forward, who, like these women are, and talking about how uncomfortable they've been made seriously," he told MSNBC's Rachel Maddow on Tuesday night. As for whether the allegations should disqualify Biden from jumping into the Democratic primary, Castro told Maddow that the decision is for Biden and the American people to make. "I know that he's a good man," he said. "I don't believe that he would have intended to cause discomfort." Delaney, D-Md., who announced his bidfor the 2020 Democratic nomination in July 2017, also appeared at the same Iowa event as Warren and Castro on Saturday. Delaney told reporters that he has "no reason to doubt" Flores, but he could not comment fully because he had not yet read her essay published in New York magazine's The Cut. "I really didn't read this story, specifically," he said. "I have no doubt, but I can't speak specifically because, hand to God, I actually haven't read the story." Klobuchar, D-Minn., first addressed Flores's allegation at an Iowa campaign event on Saturday, saying that she hadn't read her essay and couldn't comment just yet. But when she appeared on ABC's "This Week" the following morning and was asked whether the allegation should disqualify Biden from running, Klobuchar said Biden addressed the matter in his initial statement and would continue to answer voters' questions if he decides to enter the Democratic primary. "I have no reason not to believe her," she said of Flores. "I think we know from campaigns and from politics that people raise issues and they have to address them, and that's what he will have to do with the voters if he gets into the race." Sanders, a Vermont independent whom Flores endorsed for president in 2016, responded to her allegation against Biden on CBS's "Face the Nation" on Sunday. "I have no reason not to believe Lucy," Sanders said. "And I think what this speaks to is the need to fundamentally change the culture of this country, and to create environments where women feel comfortable and feel safe." Given that Flores was the only woman to come forward with a complaint about Biden at the time, Sanders told anchor Margaret Brennan that he did not believe one allegation could automatically disqualify any candidate from jumping into the race. But he also said that Flores's point that Biden's physical interactions with women needed to be take more seriously by the Democratic Party was "absolutely right," and that ensuring that women feel safe and respected both in the workplace and elsewhere should not be a partisan issue. "It is not acceptable that when a woman goes to work or is in any kind of environment that she feels anything less than comfortable and safe, and this is an issue the entire country has got to work on," Sanders said. On Sunday's "Meet the Press," Hickenlooper, D-Colo., was asked for his take on Flores's alleged encounter with the former vice president. The former Colorado governor said that he believes it's more important to recognize that the U.S. is at an "inflection point" in which more women are feeling comfortable with speaking about uncomfortable experiences they may have endured in the past. "I think our first responsibility is to make sure that we, that we allow these women, we recognize their bravery and that we listen to them," Hickenlooper said. "And we believe them, right? We have to make sure that that's the first issue." 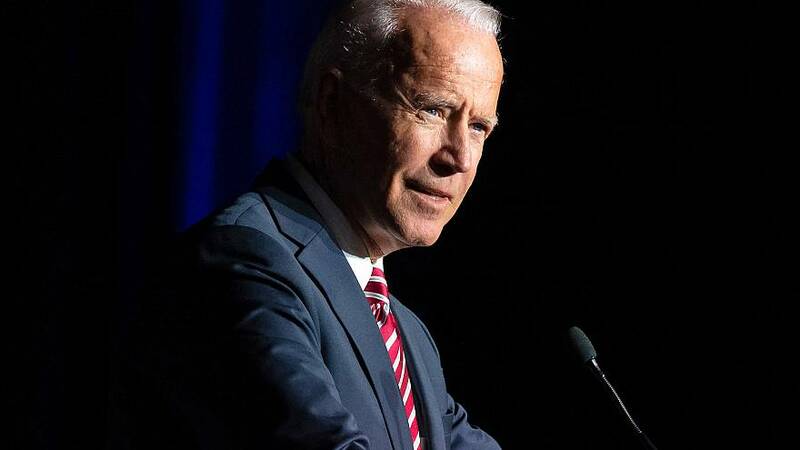 When pressed on whether he thought Biden should be disqualified from entering the presidential race, the former Colorado governor said that he could not say because he did not know all the details about Flores's experience. "I think that's why we have an election," he said. "That's that process. But certainly it's very disconcerting, and I think, again, women have to be heard, and we should really, we should start by believing them." Washington Democratic Gov. Inslee's response to Flores's account of unwanted physical contact from Biden was short and to the point, telling the Associated Press that she should be listened to. "I believe it's important to listen and take seriously any incident like this," he said. The candidate who has spoken most extensively so far about the allegations against Biden is Gillibrand, D-N.Y., who made headlines in late 2017 for leading the charge in calling on now-former Democratic Sen. Al Franken of Minnesota to resign after multiple women accused him of sexual harassment, some of which he denied. "Lucy Flores felt demeaned, and that is never okay," Gillibrand first said in a statement. "If Vice President Biden becomes a candidate, this is a topic he'll have to engage on further." The New York senator appeared on MSNBC Tuesday morning and reiterated that statement on-air, saying there needs to be more transparency and accountability for men when women speak out about uncomfortable or inappropriate encounters with them. Later that evening, when pressed on the subject by MSNBC's Chris Matthews, Gillibrand said she was not calling on Biden to stay out of the Democratic primary, but reiterated that the former vice president will have to further address the topic of unwanted physical contact if he runs. She added that the country needs to decide whether it really values women. Gillibrand also said that the allegations against Biden were not similar to what Franken was accused of in 2017, and that her response to Biden this week is different as a result. "They are very different," she said. "Senator Franken obviously had eight credible allegations against him that were corroborated in real time." Harris, D-Calif., reacted to the allegations against Biden at a presidential campaign stop in Carson City, Nevada, on Tuesday evening. Harris said Biden needs to decide whether he should still run for president — and that she would never tell him whether or not he should. She also said she believes his accusers. "I believe them, and I respect them being able to tell their story and having the courage to do it," she told reporters. After his appearance Wednesday morning at the annual convention of the National Action Network, a New York-based civil rights organization founded by Rev. Al Sharpton, former Rep. Beto O'Rourke, D-Texas, weighed in on the allegations against the former vice president, saying that Biden's accusers should be taken seriously. O'Rourke said that whether Biden runs for president in 2020 ultimately would be up to him, but that people should listen to his accusers and allow their stories to be a part of the conversation around Biden's potential candidacy and how he would stand as a potential contender for the Democratic nomination. "I'm glad that people are willing to and have the courage to step up," O'Rourke said. "They must be heard and listened to." Andrew Yang, a 44-year-old entrepreneur who announced his bid for the White House in late 2017, said Wednesday that he did not have anything unique to say when he was asked about the allegations against Biden. Viewed by some as a long-shot candidate, Yang said after his appearance at the National Action Network convention that he does not believe a decision by Biden not to run for president in 2020 would help his own chances of winning the Democratic nomination. "I'm on the opinion that the more candidates that run, the better it is for America, the better it is for my campaign," Yang told reporters. "Because as something of a political outsider, frankly, the more crowded the field is, the better it is for me." Yang said he has no reason to doubt any of the women who have come forward with allegations, but he added that he does not believe that should disqualify Biden from running for president if he wants to. "Certainly nothing I've seen or heard about Joe Biden would be anywhere remotely near disqualifying, in my opinion," he said. Booker, D-N.J., initially avoided reporters questions about the matter on Capitol Hill on Tuesday evening. But on Wednesday afternoon, Booker said it should be up to the former vice president, not him, to decide whether he should still consider announcing a 2020 presidential campaign. "It takes a lot of courage for these women to come forward, and they are standing up and telling their truth, and they should be listened to," Booker said. Ryan, D-Ohio, was asked on ABC's "The View" for his take on the allegations against Biden shortly after he announced his 2020 presidential campaign Thursday morning. Ryan, a moderate who has been compared politically to Biden by some, said the former vice president responded well to the allegations. He said Biden acknowledged his accusers and answered them in a positive manner — and that it's up to him to decide whether he should apologize to them. "What I think is that it's great to have women not just speak up, but to be heard," Ryan told co-host Ana Navarro. "And I think that was the example that the vice president set yesterday." As for how he will conduct himself on the campaign trail in the wake of Biden's allegations, Ryan said he plans to connect with voters, but not to cross any personal boundaries while doing so. "I'm a pretty friendly guy. I love to shake hands. I love to hug and kiss. I'm half Italian," he said. "You've just got to be careful, and I think people know if you're being offensive. I certainly try to absolutely never cross that line and never will."